You can access the Skills screen by pressing the [ k ] key on your keyboard. 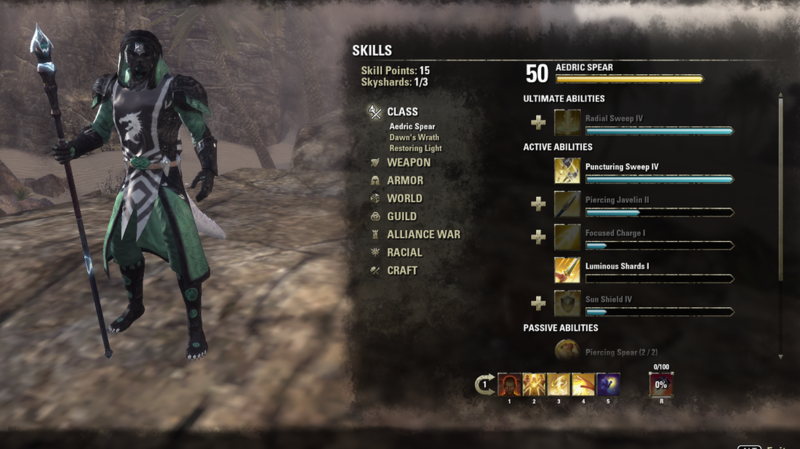 The Skills screen may be a little bit overwhelming at first. There are so many skill trees and skills to choose from. The Skill screen however is not hard to get used to and is easy to understand. So what are active abilities? Active abilities are those abilities you can equip in your skillsbar and activate by pressing the correlated key on your keyboard. Active abilities use resources when casted (Magicka and/or Stamina). Almost all skill trees on the skill screen have active abilities. Some active abilities will give you buffs and some will deal damage to enemies or affect them in another way. For example snaring or stunning. By spending skill points, you can unlock and morph (upgrade) your abilities. Allowing your abilities to become stronger and more effective. Active abilities can have very different effects. Hovering an ability with your cursor will give you more information on casting the ability. Important are the Cast time, Target, Range and Duration. If your distribution of attribute points is well focused, you should not be worried to much about how many resources an ability uses. E.g. if you decide to slot a lot of Magicka using abilities, it would be wise to have a large pool of Magicka or have very high Magicka regeneration. Each skill tree has its specific active abilities. Except the racial skill tree. It also depends on your class which skill trees you will have. In the example of the image below, one can see the Aedric Spear, Dawn's Wrath and Restoring Light trees. These are specific class trees only accessible by the Templar class. - Earning skill points can be achieved by completing quests, finding skyshards and leveling up. Similar to active abilities, passive abilities are unlockable by spending skill points into them. After spending a skill point into a passive ability, they take effect immediately. This means that you do not have to press a key on your keyboard to activate your passives. Each skill tree has its passive abilities to boost the active abilities or features of your character or that specific skill tree. Passive abilities also can affect your character stats as shown on your character sheet. You will notice that your Armour skill trees mostly consists out of passives. Allowing you to increase your armour ratings and resistance to damage a lot, without having to buff yourself with actives. Unlike active abilities, passives only affect your character and its strenghts. Well focussed selection of actives and passives, can create powerful combinations. Ultimate abilities are your powerful abilities that either deal massive damage, crowd control or support, which cost ultimate points to cast. Unlike active abilities, the ultimate can not be spammed and do not use the standard resources of Magicka and/or Stamina. Ultimate abilities charge over time during battles. Only by fighting enemies ultimate points will accumulate. How many you need to cast an ultimate depends on the ultimate ability itself. Each ultimate needs a different amount of ultimate points. How many you need to cast the ultimate, is shown by hovering your cursor over the ultimate ability. Some ultimate abilities will use ultimate points over time and stop casting after you run out. While others use all ultimate points at ones and can be casted agian when you reach the necessary amount. Ultimate abilities also have wide variations of Cast time, Target, Range and Duration. Make sure you read the information provided when hovering an ultimate ability. And prevent that you casted an ultimate too late, because you misjudged the casting time or range. Racial abilities are (mostly) passive abilities which are race specific and grant bonusses which are unique to the race. Racial abilities are a bit like Class specific abilities. They grant your character with special abilities which are (mostly) passives. Each race has different racial abilities and are tailored to fulfill a specific role. For example the Argonians have the Restoration Expertise and Quick to Mend passives. Which increase healing abilities a lot. And the Khajiit having the Stealthy and Carnage passives. Allowing for better stealth and more critical weapon rating. Which is awesome for dealing lots of damage. Combining your racial abilities with active and passive abilities can create a powerful synergy. Allowing you to become the indestructible Tank, the Damage dealer that hits like a truck or a powerful healer.